Our machines have been deployed in coal mines for the processes of digging, stacking and removal of overburden. Apart from coal mines, we have also dealt with other aggregates/minerals and materials like crushed stone, stone dust and limestone. We are reputed for the high-quality, efficient and reliable contracting services at reasonable prices. A water well is an excavation or structure created in the ground by digging, driving, boring, or drilling to access groundwater in underground aquifers. ... Drilled wells are usually cased with a factory-made pipe composed of steel or plastic. Drilled wells can access water at much greater depths than dug wells. We make all types of bores i.e. Industrial Bores, Agricultural Bores, Residential Bores & Recharge Bores from 5 inch to 12 inch. We deal only in Chennai. 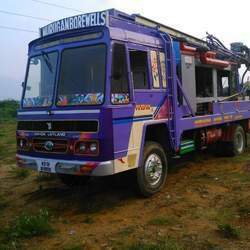 We are the deep borewell contractor.